As the Azure Functions story continues to unfold, the latest facility is the ease of creation of precompiled functions. 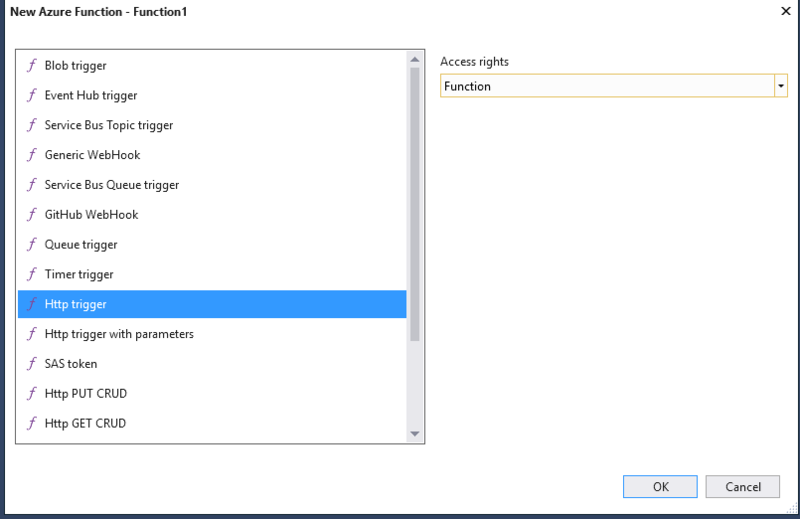 Visual Studio 2017 Update 3 (v15.3) brings the release of functionality to create function code in C# using all the familiar tools and abilities of Visual Studio development (you can also use the Azure Functions CLI). Precompiled functions allow familiar techniques to be used such as separating shared business logic/entities into separate class libraries and creating unit tests. They also offer some cold start performance benefits. To create your first precompiled Azure Function, first off install Visual Studio 2017 Update 3 (and enable the "Azure development tools" workload during installation) and once installed also ensure the Azure Functions and Web Jobs Tools Visual Studio extension is installed/updated. This will create a new project with a .gitignore, a host.json, and a local.settings.json file. The name of the .cs file can be anything, the actual name of the function in Azure is not tied to the class file name. Note in the preceding screenshot, the “WhosTheFairestOfThemAll” function is loaded and is listening on “http://localhost:7071/api/WhosTheFairestOfThemAll”. If we hit that URL, we get back “You are.”. 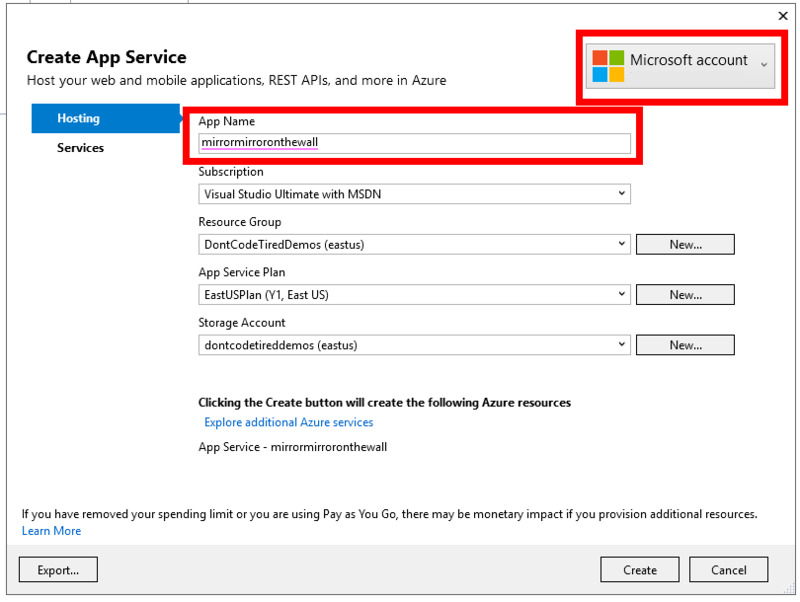 Choose to create a new Function App and follow the prompts, you need to select your Azure Account at the top right and choose an App Name (in this case “mirrormirroronthewall”). You also need to choose existing items or create new ones for Resource Groups, etc. Click create and the deployment will start. 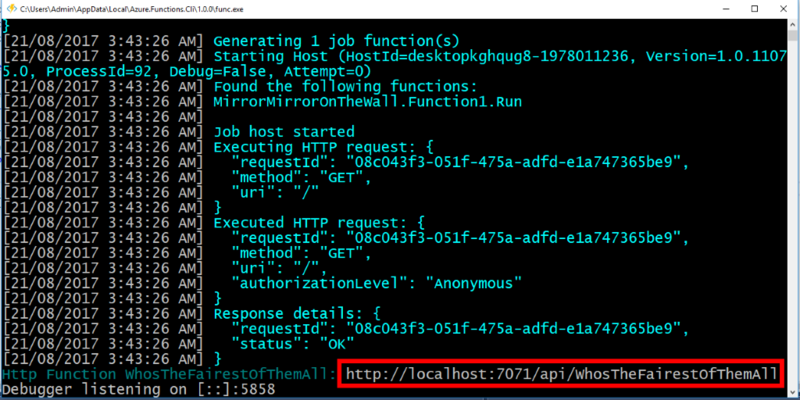 Once deployed, the function is now listening in the cloud at “https://mirrormirroronthewall.azurewebsites.net/api/WhosTheFairestOfThemAll”. 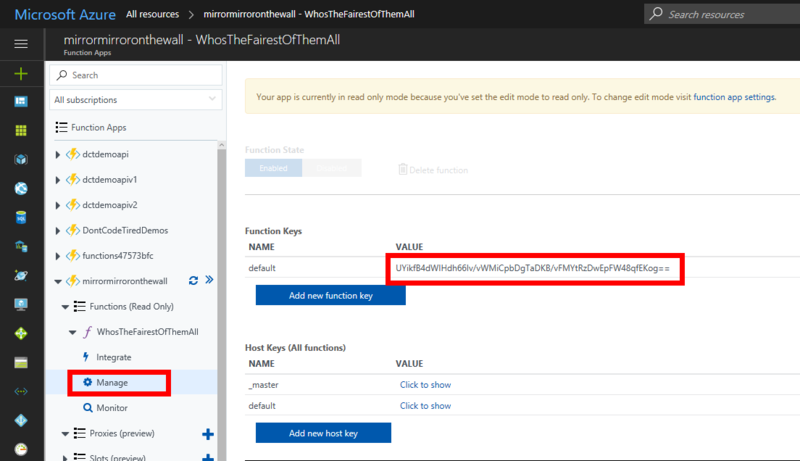 Now we can add the key as a querystring parameter to get: “https://mirrormirroronthewall.azurewebsites.net/api/WhosTheFairestOfThemAll?code=UYikfB4dWIHdh66Iv/vWMiCpbDgTaDKB/vFMYtRzDwEpFW48qfEKog==”. Hitting up this URL now returns the result “You are.” as it did in the local environment. To learn how to create precompiled Azure Functions in Visual Studio, check out my Writing and Testing Precompiled Azure Functions in Visual Studio 2017 Pluralsight course.